Let me once again welcome you very warmly to North Rhine Westfalia. Now in our first parliamentary building and its more intimate atmosphere. I have a very deep sympathy for your country – or shall I better say: your kingdom. 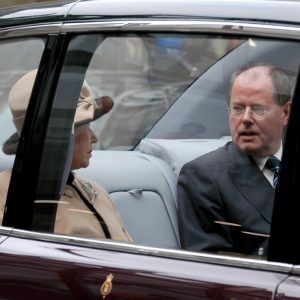 It all started when I first visited Britain at the age of 18 – incidentally in 1965, the same year that saw your first visit to North Rhine Westfalia, Your Majesty. Little did I know that nearly 40 years later I would have the honour to welcome you in Düsseldorf as Prime Minister of our region. Since that first visit to the United Kingdom, my interest in its way of living, its history (above all in the short 20th Century from 1914 to 1989 tragically entangled with Germany), its culture, its people, and in its economic and political development has never ceased and has probably influenced me more than I realize. What I can say is that I admire the British sense of humour – including its darker versions and the self-irony Britons are capable of -, British pragmatism and common sense and a certain ability to remain relaxed. For instance when it starts raining in Wimbledon, as it did this year when my wife and I visited the tournament on the first weekend of July. Perhaps we in Germany should import some of these qualities in addition to goods and services. How knows: a stronger dose of black humour, common sense and pragmatism would probably help us in these times of difficult political and social reforms. Instead the so-called "German Angst" is a term now familiar in the United Kingdom and beyond. It stands in stark contrast to other images of Germany that indeed still are popular in some British media, as Foreign Minister Fischer pointed out two weeks ago when visiting your country. As a good European neighbour. But also a European country like any other, with strengths and weaknesses, with some habits that are shared and others that may be strange or particular. Indeed, like a typical neighbour. I am not hiding my personal affection for your country nor my attachment to it. 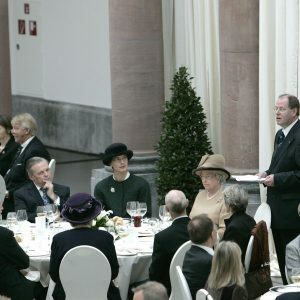 What is more relevant, however, is that it reflects the reality of close ties between the United Kingdom and Germany, and North Rhine Westfalia in particular. Ties of which we should remind ourselves more often. The wide range of people from both our countries you have met earlier and the distinguished guests gathered here stand for the intensity and the variety in our relations. Our guests represent the world of business and culture, politics and sports, education and science. We know that there is still more that we can do, and that is what we should all be striving for. But we are today in a position to further improve our relations on the basis of a very stable foundation. I sincerely hope that following your visit to North Rhine Westfalia today you will return to your country with the impression that the decision to create this region has proven to be worthwhile. And I can only thank you for taking a continuing interest in this region and its people. I ask you to rise and drink a toast in honour of Your Majesty and Your Royal Highness and to the friendship between our countries.